Pretty Things | Beer Apprentice - Craft Beer News, Reviews, Interviews and Info. Hello everyone. For today’s craft beer review I’m going to be trying the Pretty Things Our Finest Regards brewed by the Pretty Things Beer & Ale Project situated in Cambridge, Massachusetts. I’ve enjoyed most of the Pretty Things beers that I’ve tried thus far and I’ve always enjoyed Barleywines, so I’m rather excited about sampling this beverage. The website, prettybeer.com, had a very lengthy description about Our Finest Regards, so I’m not going to copy it here, however I would encourage you to journey over there and take a look. This beer had an ABV of 13.5% and it came in a 22 oz. bottle. It poured a deep burgundy to brown color. The head was light tan, smooth and creamy, yet kind of small from a very, very gentle pour. The retention time was slight and it left a thin skim of lace that eventually fell into the liquid to expose some sticky, clear alcohol legs on the sides of the snifter. The nose released hints of earthy hops, spices of clove and deep, dark fruits of plum. Feeble bits of nuttiness intermingled with a woody and leather component, which was followed by sweet tones of caramel and/or toffee malt. The taste seemed to push the sweet toffee and caramel malt to the forefront. The clove and the dark fruits showed themselves again, however they didn’t seem to be overly robust. A decent shot of alcohol was there too. Of course I expected that considering the high ABV. It also released some bready savors and another relish of wood. The mouthfeel was medium to full bodied. Chewy, smooth, dry and slick. The carbonation was on the lower side as well. The warmth from the alcohol was duly noted and a sturdy amount of flavor was left behind on the palate after each sip. Overall, I thought this to be a very good beer. To me it seemed to be a lot like a mix between and English Barleywine and a Belgian Quad. Very complex in that regard. This beer is definitely a sipper though and should probably be relegated to the Winter or at least the cooler months of the year because it will take a long time to finish a bottle if you are trying to tackle it by yourself. Well, it did for me at least. Either way, give the Pretty Things Our Finest Regards a try if you have the opportunity. Be sure to tell me of your opinion when you do. Hello everyone. For today’s craft beer review I’m going to be trying the Pretty Things Baby Tree produced by the Pretty Things Beer & Ale Project located in Cambridge, Massachusetts. So far, I’ve been fairly happy with all of the Pretty Things beers that I’ve tried, however I’ve yet to taste the Baby Tree. I’m kind of excited about it though because I’ve heard good things. From the website, prettythingsbeertoday.com, I found this rather lengthy bit of information about the beverage. Baby Tree was our first Easter beer. We LOVE Easter here at Pretty Things. Usually after the long Boston winter, we’re itching to bring out the bunnies, bonnets and yellow fluffy chicks and get on with our Springtime. The Baby Tree is a real tree. This must be said. It dwells in Sexhow and carries cavorting baby-dolls and in season, a few pears appear. It belongs to great friends of Dann & Martha, and they chose to rescue these small plastic people from a landfill-fate by allowing them to ride in their pear-tree many years ago. And thank heavens they did. Our Baby Tree is a very magical, traveling tree filled with waving, happy babies, some of whom may or may not resemble Mikheil Gorbachev. There may also be some discrepancy in the number of limbs, but we cannot be sure where other baby heads may be poking through the leaves so we don’t worry ourselves about it. If you want, read our poem about it. Baby Tree beer is a Pretty Things take on the best of Abbey-style brewing from Belgium. Inspired by monastic and abbey quadruples, embellished with dark fruit flavours, not too sweet, not too heavy, it’s a springtime beer with some of the richness of late winter. It makes it perfect year round, so that’s when we offer it! You should be able to find it most months of the year, on draft or in bottle. All in all, it’s our way of bringing a bit of Springtime to you and to us, all year round. Hooray! Ok. That description is a bit different. Let’s pour it and see how it looks, smells and tastes. It poured a deep brown to deep burgundy color with a slightly off white/egg shell tinted crown. It was sized very well and it was both smooth and slightly creamy in texture. The retention time was excellent and the lacing was exceptional. Simply, a beautiful looking beer to say the least. The nose released a very nice waft of sweet, dark fruits. Plums, raisin and fig followed by a sturdy yeast component. Hints of dark breads and spicy clove added more attributes and really kept this beer in line with the style. The taste was more of the same. Plums, fig and raisins. A sweet and sugary profile co-mingled well with the breads, yeast and spicy clove. A minor savor of alcohol was discovered, but the dark fruits continued to be the forerunner. Nothing over the top or nothing out of the ordinary. Just solid and true. The mouthfeel was medium bodied. Very smooth, chewy, dry and kind of sticky. The carbonation was spot on and a little bit of warmth was felt from the alcohol. A substantial amount of flavor was left on the palate after each sip too. Overall, I really liked this beer. Like I mentioned before, it really follows the “Quad” style well. It doesn’t try to be anything it’s not. It has plenty of character and personality without being overly complex and the drinkability was quite good. It’s definitely worth a try if you are looking for a good American Quadruple and I’d sure pick it up again, especially if I wasn’t able to obtain one of the more well know Belgian Quads. So, give the Pretty Things Baby Tree a try if you happen to stumble across it. I think that you will be pleasantly surprised as to how well it is made. Be sure to leave a comment if you’d like and tell me your perspective of the brew. Hi again guys. 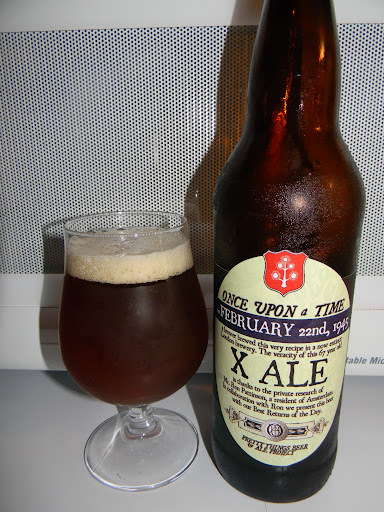 For today’s craft beer review I’m going to be trying the Pretty Things Once Upon A Time X Ale: February 22nd, 1945 produced by the Pretty Things Beer & Ale Project located in Cambridge, Massachusetts. From the website, prettythingsbeertoday.com, we find out that this is the second of a twin release set along with the Once Upon A Time X Ale: November 22nd, 1838 edition. Mild was a hugely popular style for more than a century (1800-1900s). Here, we have released two mild ales side-by-side. : two beers from opposite ends of that period, brewed by the same brewery. If you drink both, you will drink the same brand from the same brewery separated by 107 years. Over those years, Mild changed considerably: something these beers amply demonstrate. Though bearing the same name, X Ale, in character they could hardly be more dissimilar. The 1830s saw the beginning of a boom in Mild ale brewing, which in 30 years became England’s favourite beer. This beer, 1838 X Ale is a typical London Mild of the era: bigger and more robustly hopped than modern versions. Brewed from 100% pale malt and Kent hops, this is a straightforward, uncomplicated beer, much like the working classes who first drank it. The colour is also much paler than you might expect. From this original form, Mild was to undergo many transformations, culminating in the second beer in this series, February 22nd, 1945. Drink them side-by-side to compare how this beer style evolved. This brew came in a 22 oz. bottle and the ABV was an extremely low 2.8%. It poured a deep, golden/brown color with an off white head. The size was sufficient and the texture was kind of soapy with some larger bubbles. The retention time was alright and the lacing looked ok. Overall, not a bad looking beer sitting in the glass. The nose had a very nice waft of toasted breads, grain and biscuits. Hints of a spicy rye or something as well. It also smelled like dried leaves. Towards the end I started to pick up on a slight inkling of caramel malt. The bouquet was quite admirable and harmonized. I liked it. The taste revealed some burnt and toasted grains. Savors of wheat and rye bread. Somewhat spicy too. Kind of like poppy seeds. Very light caramel malt flavors and some earthy goodness. In a lot of ways it reminded me of unsweetened tea. Again, nicely balanced, but not overly robust. The mouthfeel was medium to medium/thin bodied. Mostly dry and smooth. The carbonation was admirable, but not a terrible amount of flavor was left behind. Well, I wasn’t really sure what to expect from this brew, but I quickly found out that it was pretty good. It’s a “true” session beer. The drinkability was outstanding. I couldn’t believe how much flavor it packed for such a low ABV beer. I can’t say that it’s my favorite style, however I enjoyed it nonetheless and had no trouble whatsoever in finishing the bottle. So, if you guys happen to see the Pretty Things Once Upon A Time X Ale: February 22, 1945, give it a try and tell me what you think. I’d be interested in hearing your opinion.